June 11, 2018 | June 11, 2018 | Amanda George, CPA, M.H.S.A., has been named associate vice chancellor for clinical finance and chief financial officer for the Integrated Clinical Enterprise at the University of Arkansas for Medical Sciences (UAMS). George has been at UAMS since 2013. George previously served as service line administrator for the Medical Specialties service line and as administrator for the Department of Internal Medicine. Before joining UAMS, she served as controller for ambulatory services for the East/Southeast division of Catholic Health Initiatives in Little Rock and assistant controller for St. Vincent Health System hospitals in North Little Rock and Morrilton. 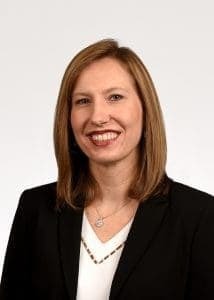 She is a certified public accountant and has a bachelor’s degree in accounting and finance from the University of Central Arkansas and a master’s in health services administration from UAMS.